Working in central London as I have been for the past 5 years, I draw a lot of inspiration from some of the architecture and history that I walk past every day. So many of my fellow commuters just rush along either glued to their mobile phones or staring at the pavement. Sometimes I want to scream at them to LOOK UP! There is so much beauty around us (both natural and man-made) that can invigorate us and brighten our day if we only let it. 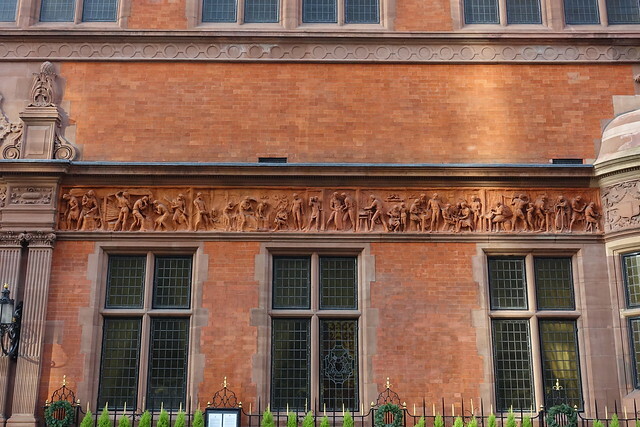 I have seen a lot of amazing carving on my travels (most of it in stone), but there is one carving which is by far my favourite and it is found on the Cutler’s Hall building on Warwick Lane. 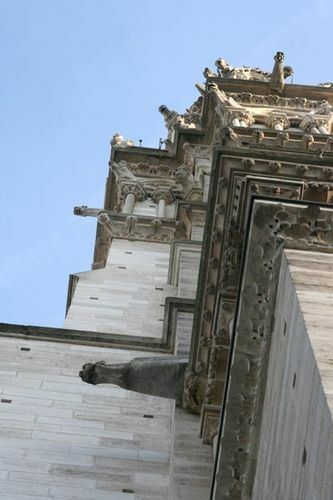 I have drawn some funny looks from passers-by as I stand on the street looking up at it. 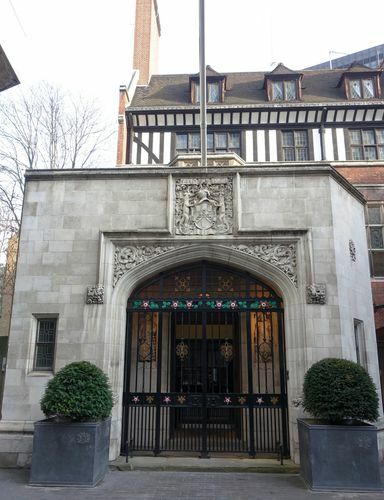 Cutler’s Hall is home to The Worshipful Company of Cutlers. 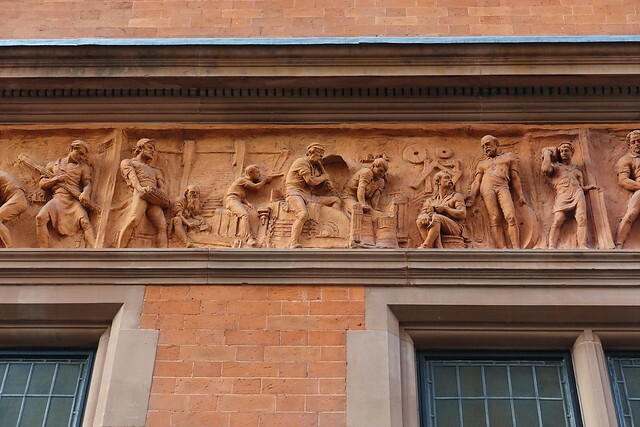 It is a terracotta carving by Sheffield sculptor Benjamin Creswick (1853-1946). 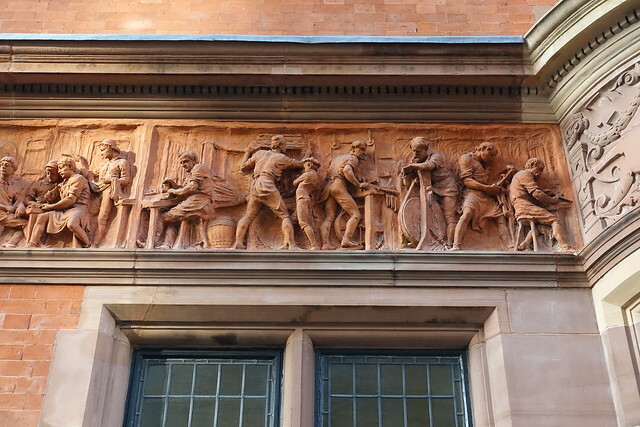 The frieze shows cutlers working at their craft. Creswick was a pupil of John Ruskin and had worked as a grinder in Sheffield. He exhibited frequently at the Royal Academy, but few examples of his work survive. If you ever get the opportunity to see it in person, you won’t be disappointed. However I realize that most of you won’t and so I thought I’d take the opportunity to share it. I uploaded the photos to my Flickr account, so you can click on them to see enlargements and examine the details. Once you are viewing them in Flickr, click on the image to enlarge it. The more you look, the more you’ll see. 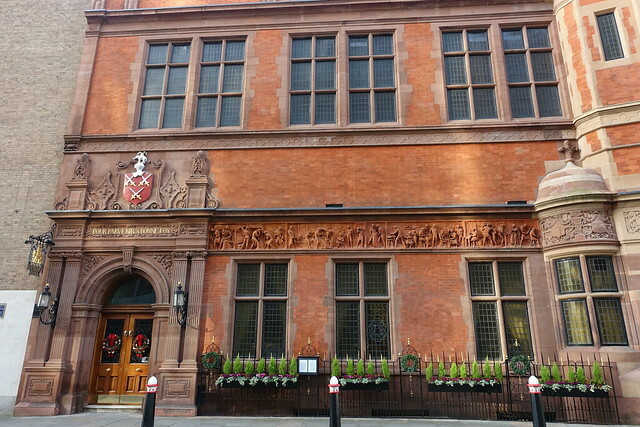 Photo 1 – The front of the building. 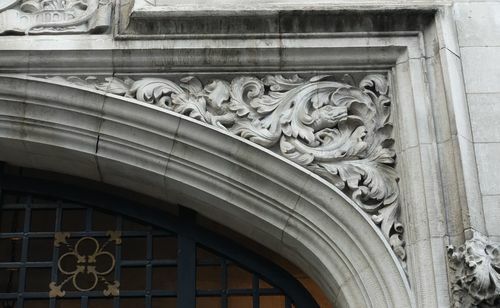 Photo 2 – The entrance. 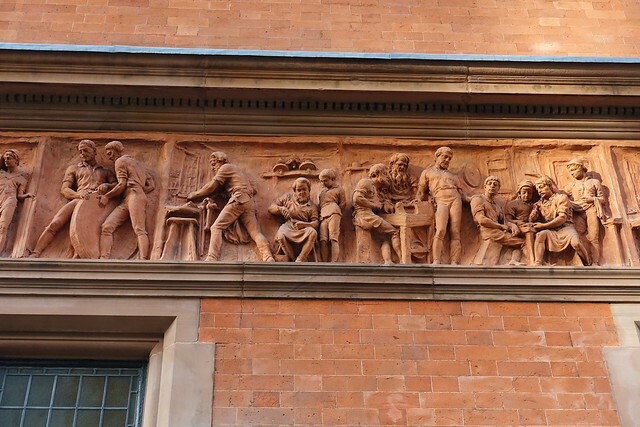 Photo 3 – The frieze in it’s entirety. 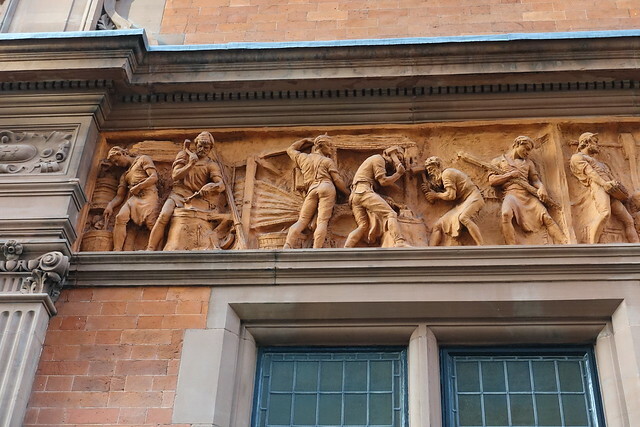 Photos 4-7 – Some detail shots of each panel in the frieze from left to right. That sure is beautiful work Andy. Just a bit far for me to travel to see it, so thanks for sharing. Beautiful Andy. I agree, there is so much to see around us if we just look. Thank you sir! 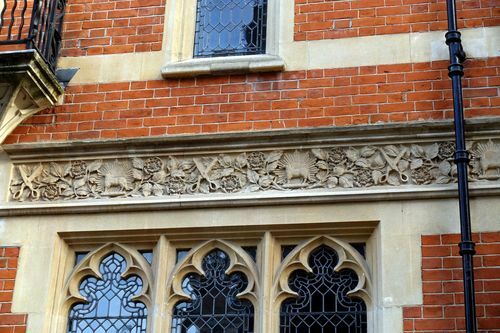 These are absolutely beautiful carvings that most of us have walked passed on our daily commutes. Their website gives even more pictures http://www.cutlerslondon.co.uk/hall/. 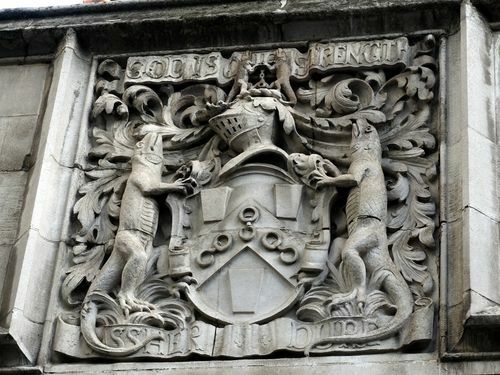 There are many more Guild Halls in the City of London that have incredible examples of their individual crafts. They are all worth looking at. Indeed there are Jim, like Ironmonger’s Hall next to The Museum of London for example. 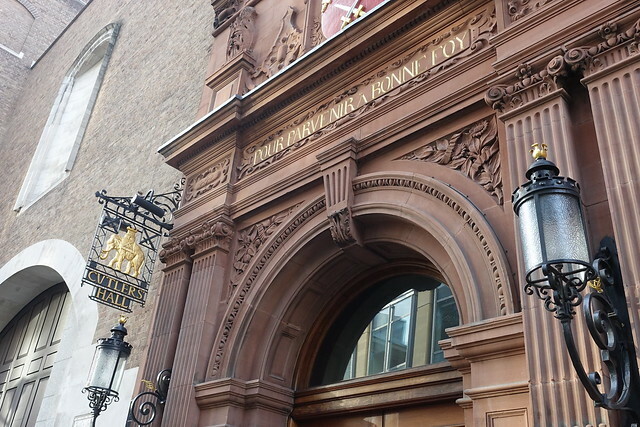 The insides of these buildings are often just as spectacular with beautiful paneling and stained glass. or this one the name of which escapes me, but I think it is something to do with fashion. Taking your time to smell the roses is one of life’s best secrets. There’s a lot to be learned by just looking around. I’m glad you’ve found inspiration on those lowly Monday morning walks to work. Wonderful! Thanks for sharing! I know the feeling, I lived in Vienna before moving to Italy, there is just so much to see, think of the people who came up with these originals, the time, effort, working conditions they went through to leave us so much beautiful art. I had an Austrian carving instructor who kept saying the carving is not so hard, you learn the motions. It’s learning to see that’s so difficult. Beautiful work however, i know what you mean about people just dont lift there eyes above street level, my home town of Nottingham has some wonderful old buildings (we had a lot more but the local council saw fit to demolish them and build boxes in there place) to cherish if only you lift your eyes and look. Thank you for this little travel to London. I enjoy that you bring light. As an architect I am used to looking up when I travel, but somehow I have to force this when I am home in Copenhagen and when I do I also become amazed of all the beauty there are between the sky and my nose. Thanks for the inspiration, I can really use this as I go to my weekly clay croquis class, perhaps I will ask the models to make some working positions from now, like please little miss Olsen, pretend as if you hold a saw… smiles. 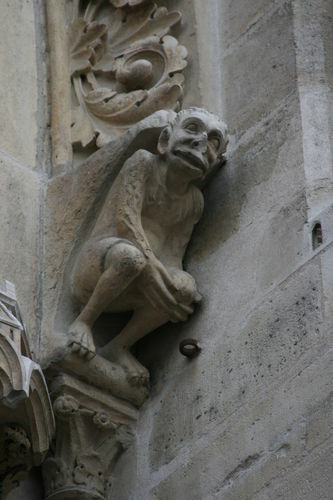 I love grotesques and gargoyles. I have a sub-folder full of them on my PC. Yet another thing we share. I have taken so many pictures of those little wonders of art during the years, especially in Paris. Oh yes! I am conscious of the resemblance now that you point it out. Do you have a photo of the elevation view of this building Mads?